“This moon is about settling into being, by this we mean, acknowledging who you are, finding yourself, and letting go of the personas and the personalities that are projected onto you by yourself and others. This moon is about healing the relationship with yourself and we celestial light beings are 18th dimensional beings, we do not take physical form, but we understand that while you are on the earth plain you are trapped in polarity but by increasing your energy vibration you allow yourself to step out of polarity and to see polarity for what it is, actually an illusion. 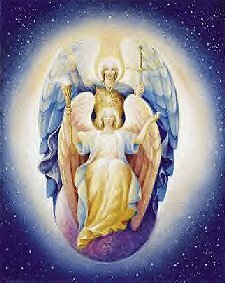 And therefore in this moon cycle, we, supported by Archangel Michael and Lady Faith, are aiding you in letting go of the shackles that hold you back in life by exposing you to our high frequency energy with Archangel Michael the Angel of Protection anchoring you, whilst we do this powerful healing meditation. a state where you can let go of pains, aches, illnesses if you are willing and ready to do so, we will programme high frequency light into your bone marrow, which creates your blood and then filters through your whole body. In this full moon workshop, led by Alphedia Arara, she will connect you with the celestial light beings Archangel Michael and Lady Faith. You will experience a live channeling and be supported by the sounds of the sacred heart drum and tibetan singing bowls which Alphedia will channel along with a guided meditation led by these great beings. You will go on self realisation exercises to look at areas of your life or body that you would like to focus on healing.